The innovative adhesive systems are made of a highly elastic material. The gripping and detaching of objects is affected by smart surface structures. This enables to dispense with pointed grippers or tweezers. As a result, objects can be transported and deposited in the production process without any risk of injury to humans or damage to the objects. The adhesive structures are particularly suitable for sensitive parts, such as devices for the automotive, semiconductor and display industries. This innovation can be expanded to include all processes in which Cobots are used, even in challenging environments such as vacuum. 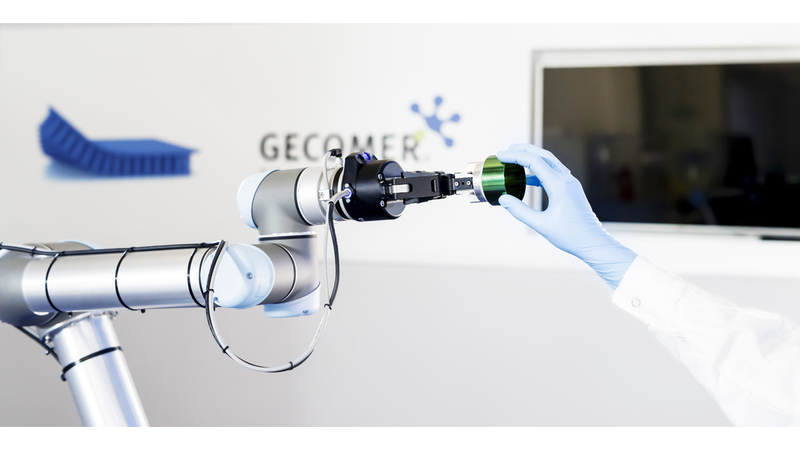 Regardless of whether the structures are used in robots or in Cobots, researchers at INM have not only proven the suitability of Gecomer® in various industrial environments. In their InnovationCenter, they also successfully developed an advanced roll-to-roll process, which enables the adhesive structures to be produced in large quantities at low cost.